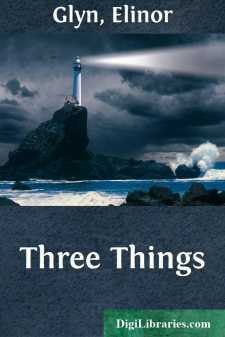 I have called this little collection of articles which I have written “THREE THINGS” because to me there seem to be just three essentials to strive after in life. Truth—Common Sense and Happiness. To be able to see the first enables us to employ the second, and so realise the third. And in these papers I have tried to suggest some points which may be of use to others who, like myself, are endeavouring to reason out ideas to a good end. How often one sees people who could be very happy, and who yet with incredible blindness and stupidity are running their heads against stone walls (or feather beds!) and destroying all chance of peace for themselves, their mates, and their households! Everything is very simple when it is analysed down to what nature meant in the affair—and by doing this one gets a broader perspective. For instance, nature meant one thing in the connection of man and woman—and civilisation has grafted quite another meaning into it, and the two things are often at war in the State called marriage! In the chapters devoted to this subject I have tried to exploit some points which are not generally faced, in the hope that if understood they might help towards Happiness. The thing which more than half of humanity seems to forget is the end they have in view! They desire something really ardently, and yet appear incapable of keeping their minds from straying into side issues, which must logically militate against, and probably prevent, their desire’s accomplishment. This is very strange! A woman for instance profoundly desires to retain a man’s love when she sees it is waning—but her wounded vanity causes her to use methods of reproach and recrimination towards him, calculated certainly to defeat her end, and accelerate his revolt. I feel that in publishing this little collection in America I must ask indulgence for the parts which seem to touch upon exclusively English aspects of the subjects under discussion—because the main ideas apply to humanity in general and not to any particular country. The paper on Divorce is of course written from an English point of view, but its suggestions may be of some use to those who are interested in the question of divorce in the abstract, and are on the alert as to the results of its facilities in America. I do not presume to offer an opinion as to its action there; and in this paper am not making the slightest criticism of the American divorce laws—only stating what seems to me should rule all such questions in any country, namely,—Common sense and consideration for the welfare of the community.